Thank you for your interest. In this book, we discuss developing a diversified, sustainable and resilient agricultural system, reducing food waste & loss in the supply chain, developing the nonfarm sector, extending safetynets & reducing the TripleBurdenofMalnutrition to achieve nutritionsecurity by 2050. We present & discuss opportunities & challenges that urbanization, demographic changes, rising obesity & NCDs, role of climatechange, staple grain fundamentalism in agriculture production, rising regional inequality pose for achieving nutrition security in 2050. To achieve nutrition security & to continue its meteoric rise, India, should integrate goals for economic development with gender equity, agricultural development & reduction in the TripleBurden while accounting for threats from climatechange. The goal of the book is to provide a platform to bring together practitioners, researchers and policymakers & scholars like you who are currently engaged with these important questions. 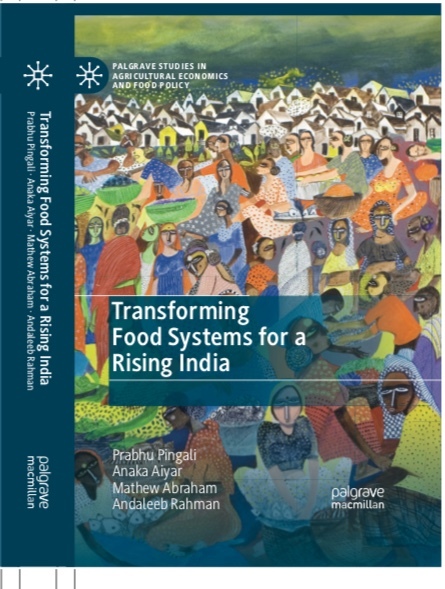 Capturing the vibrancy of your voices and your continued scholarship and engagement (on the ground, in the field, in policy circles, in board rooms and in homes) will be key to realizing a FoodSystems transition towards a nutrition secure future. I would love to hear your experiences, thoughts or research on this topic(s). You can reach me at aa693[at]cornell[dot]edu & anaka[dot]aiyar[at]gmail[dot]com. Anaka is a post doctoral associate at the Tata Cornell Institute at Cornell University, Ithaca, NY. Her research interests lie at the intersection of health and development economics.